Designed for photographers passionate about wildlife – amateurs and professionals alike, seeking the beauty of the wilderness, nature and the great outdoors. This workshop encompasses the best of the Wild White Horses shoots; the imposing Black Camargue Bulls thundering their way through the marsh with horns held high and stunning Camargue birdlife, including flocks of Pink Flamingos as they take flight in ‘V-formation’ at sunrise. 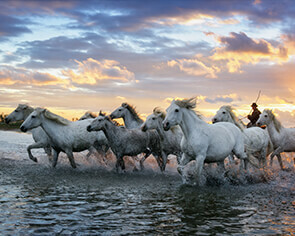 Create Away is the number one specialist and the only photography workshop company actually based in the Camargue. Create Away has strong and long established links with the local people of the Camargue; their deep respect for the traditions and wildlife of their treasured land adds greatly to the experiences you will enjoy during the various shoots of the workshop. Ideal for Wildlife and Equine photographers. We will collect you from the airport for transfer to your charming hotel in the centre of Aigues-Mortes, a medieval town that lies within rampart walls a mile long, where you can take time to unwind, unpack and perhaps explore the surrounding streets. Welcome drink & briefing meeting, during which we will take you through the itinerary and offer advice for the action-packed shoots you’ll experience. We spend the morning at the Parc Ornithologique, which is a natural Camargue wetlands area of great importance. Accompanied by Thierry, our BBC Wildlife bird specialist and expert in his field, we will have exclusive pre-dawn access to the park long before it is opened to the public enabling you to photograph the birds at their best in the early morning light. Thierry will guide you to the prime locations among the waterways and lakes to capture a wide variety of species in one of the largest arrays of birdlife in Europe, from single birds perched at the nest to large flocks of pink Flamingos. In the afternoon, we witness the Black Camargue bulls thundering through the shallow waters of marshland, their distinctive horns held high, as they are herded by the Gardians on horseback – a unique photographic experience. In the afternoon, we photograph the Wild White horses running through marshes – we shoot several drives with the horses running across your field of view and heading straight towards your cameras! We will also take shots of the ‘Gardians’ (Camargue Cowboys) dressed in their traditional Camargue shirts & hats, trident in hand, surrounded by the herd, as well as some close-up portraits of these ‘weathered’ ranchers. At dawn, we photograph Wild White horse stallions fighting – this is a unique opportunity to photograph these magnificent creatures with their feisty temperament in full flow, as they rear and entwine at full height. 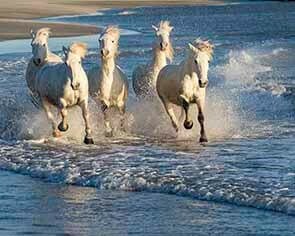 Late afternoon, we head back to the beach for the ultimate spectacle of the wild horses running along the golden sand and through the surf with sea spray flying! We shoot several drives in a number of directions, so you can capture an assortment of dramatic action pictures with a variety of lighting conditions. There will also be another opportunity to take a variety of shots of the ‘Gardians’, plus portraits of the wild horses. For the final morning, we head to the beach for a shoot with a single white stallion. We photograph him dashing and diving in and around the sea and surf, as well as rearing on the top of the sand dunes, making for a wide range of dramatic action shots. Free time for lunch before departing for the airport early afternoon.